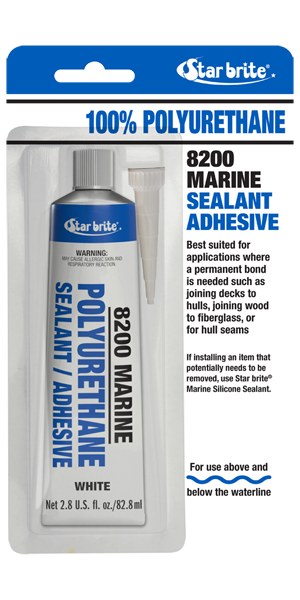 Star brite® Polyurethane 8200 Marine Sealant/Adhesive is a premium grade, one part, non-sag polyurethane sealant that offers outstanding performance. Ideal for use above and below the waterline where a permanent bond is needed. Best suited for applications such as joining decks to hulls, joining wood to fiberglass or for hull seams. Remove cap. Puncture inner seal. Cut nozzle to desired opening with knife or razor blade. Attach nozzle to tube. Hold nozzle at a slight angle to joint or seam and apply firm, continuous pressure on tube to maintain an even flow of sealant. Squeeze from bottom of tube up, pushing caulk ahead of nozzle, so that the nozzle tools the sealant into the cracks or openings. After opening tube, sealant must be used within 24 hours. Do not apply if temperature is below 40°F (4°C). Sealant becomes tack-free in 8 hours or less, totally cures in 2 to 3 days. Polyurethane is not recommended for use on teak seams.